The murders of nine people in a historic African-American church in Charleston, S.C., brought quick demands across the nation to bring down that state's official flag -- a Confederate banner symbolizing for many its history of slavery and racism. But surprisingly, there seems to have been no new call in Maryland to bring down its state song, "Maryland, My Maryland" -- an anthem steeped in that same ugly history. ((UPDATE JULY 10: The Frederick News Post reported this week that state Delegate Karen Lewis Young, a Democrat from Frederick County's District 3A, has submitted a bill to at least change the lyrics -- replacing them with a poem by the same title written in 1894 by John T. White, a Frederick County native. I took note of the song's history in The Real Muck four years ago, as Baltimore marked the 150th anniversary of its "Pratt Street Riot" when federal troops -- summoned by President Abraham Lincoln to defend Washington in the wake of the fall of Fort Sumter in South Carolina -- were attacked. No one died in the Confederate conquest of Fort Sumter, but as the troops marched through Baltimore from the end of one rail line at President Street to another, at Camden Station close to a mile away, a southern-sympathizing mob began throwing rocks and bottles. Then came gunfire, and at least 16 deaths... the first casualties of what became a four-year war. The riot inspired an incendiary poem by James Ryder Randall, "Maryland, My Maryland!," which was subsequently set to music (as in "O Tannenbaum") and became the official state song. Huzza! she spurns the Northern scum! She breathes! she burns! she'll come! she'll come! Interestingly, assassin and Maryland-born actor John Wilkes Booth shouted, "Sic semper tyrannis!" after shooting Lincoln on April 14, 1865, five days short of the Pratt Street Riot's fourth anniversary. The question is whether Maryland could do better. I suggest a competition inviting Maryland's many talented songwriters to propose a better anthem, with original music -- one that sings to a brighter future rather than an ugly past. 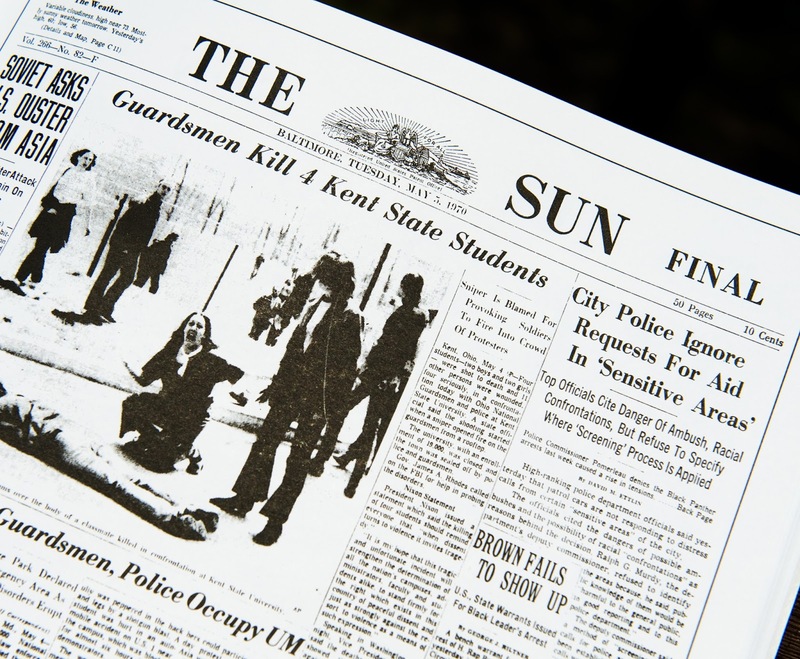 Today marks the 45th anniversary of Ohio National Guard soldiers fatally shooting four students during a protest of the Vietnam War at Kent State University. The eventual Pulitzer Prize-winning photo of a young girl kneeling in anguish over the body of one of the slain students ran atop the front page of newspapers across the world. In the next morning's edition of The Baltimore Sun, the Kent State story ran under the picture. But the lede story -- at the top right of the page -- carried my first front-page byline, and had nothing to do with the shootings or the increasingly unpopular war that was raging in Southeast Asia. My story was about policing and racial tension in the City of Baltimore. You don't see much these days about war protests, even though America has been at war for close to 14 years in Afghanistan and Iraq. 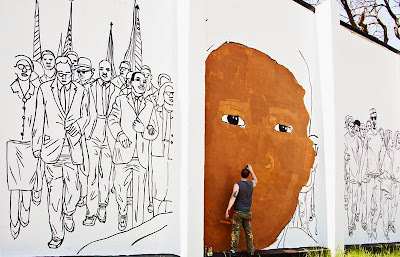 But racial tension is back in the news in Charm City, in the wake of the arrest by city police officers, and subsequent death, of 25-year-old Freddie Gray in a westside neighborhood little changed economically or demographically since the rioting here and elsewhere that followed the 1968 murder of the Rev. Martin Luther King Jr.
My story began with a call to the city desk by a priest at a Catholic church along Old York Road, about two miles north of the central downtown area. A man who had been robbed had come knocking at rectory door in the wee hours, seeking help. To the priest's astonishment when he called the police, he was told that officers could not respond there because it was a "gray area." It turned out there were half a dozen so-called "gray areas" around the city, each of them near the location of headquarters of what were perceived as black militant groups. In this case, it was a group called Making a Nation, located more than a block away on Cator Avenue. The fact that the city police were refusing response to portions of Baltimore out of fear of provoking racial unrest was stunning enough to make it the top front-page story in Baltimore the next morning. Not many people remember my story. Kent State, however, was and remains a watershed moment in American history. The "gray areas" fiasco proved to be misinterpretation of a directive issued by then-police commissioner Donald D. Pomerleau for officers not to respond to any of the addresses occupied by black militant groups without the presence of supervisory personnel. You don't hear the term "black militant groups" in Baltimore these days. More often, you hear about street violence and gang disputes over drug territory. The 2015 gang roll call: Crips, Bloods, Black Guerrilla Family. They were more about turf control for drug dealing and crime than addressing racial inequities in Baltimore -- until last week, when gang leaders came together seeking to discourage the rioting and disorder that brought a surge of thousands of police officers and National Guard soldiers into town. In 1970, Baltimore was a powder keg of racial tension. It was just two years after the King riots, whites were fleeing to the suburbs in ever-increasing numbers, the downtown shopping district was in its death throes, and police were trying to avoid confrontations that might make matters worse. Forty-five years later, the city population has shrunk to about 630,000. Parts of Baltimore look like ghost towns for all the vacant buildings. Poverty is endemic, opportunity elusive. The American Dream -- well, what is it? Does it even exist in cities like Baltimore? Or is it just an American Nightmare now. Today, driving through town, we were passing through a section where a week ago young people had been throwing rocks and bottles at riot-equipped cops in skirmishes broadcast live on television, globally. It was an explosion of the racial powder keg, again. At the intersection of Mount and Presbury streets, an outdoor mural artist who uses the name Nether was rolling brown paint to create a giant image of Freddie Gray's face, flanked by a scene of marchers for social justice. There was not a police officer or soldier in sight. No. 1 is "Cops Lie." No. 2 is "Cops can't spell." I mean no disrespect for officers of the law. I like most cops I've met. But I deemed it important for folks in the news business to understand that cops are very much like other folks you meet -- they do not always tell the truth or get things right. Face it -- everybody lies. Maybe not all the time, but sometimes. And who hasn't made a spelling error? The point is to understand that information you are being given may not be accurate or true. Journalists have an obligation to check facts and get other points of view. Truth can be elusive, perhaps not even possible to ascertain. I learned about cops lying -- or perhaps not telling all the truth -- as a young police reporter at The Baltimore Sun nearly half a century ago. A tactical squad sergeant invited me to go along on drug investigations and raids with his team of about half a dozen men. But I had to make a deal with the devil. I might witness some activities that I had to agree not to report in my story. The first such incident came as the cops were trying to locate a drug dealer, and leaned on his mentally slow brother-in-law for information, stopping by the man's tiny street-level apartment in pre-urban renewal South Baltimore. They told the man he faced arrest for drug possession and, to his denials, got him to agree to a search of his dwelling. As they rummaged around, one of the officers planted a packet of powder under a lamp, then "found" the supposed drugs. The guy was scared. And then, to avoid arrest, he told the team where to find his brother-in-law's drug stash nearby. That was a little deception, a warrantless search -- a shakedown, really -- at the expense of a simple-minded citizen of Baltimore to get what they wanted. And it was part of the investigative process that I was bound by our agreement not to report. Which brings us to Pennsylvania Avenue, in 1969 an epicenter of illegal drug activity -- and this week, an epicenter of the protests over the strange death in police custody of Freddie Gray. It was another investigation here by the squad, this time with a search warrant for a building that had a padlocked front door. Two men sitting on folding chairs on the sidewalk in front of that building were detained, while the squad broke open the padlock and began combing through a 3-foot-deep heap of trash piled inside. They found, at the bottom of a trash can under the pile of debris, a plastic bag containing filled drug capsules. Neither of the suspects resided in the building, and neither had a key to the padlock. Neither was holding drugs. They had been sitting in chairs on a public sidewalk. And they were charged with possession with intent to distribute narcotics. In the official report on their arrest on drug charges, the cops wrote that the men were "on the premises." As distasteful I deemed their deception in the case of the feeble-minded brother-in-law, which I was unable to recount in my story, I realized in the Pennsylvania Avenue arrests that the cops were lying in their official report -- and this time, I was free to write the circumstances of the search and arrests, and quote from the official report by the police that the suspects had been "on the premises." They were not in jail very long. Defense lawyers noted my first-hand account as proof that the men had been outside the premises -- not on the premises. I asked the sergeant about that, and whether the men his team had arrested were in fact guilty. "They were dealing drugs, Dave," was the sergeant's reply. "Maybe not there, but they were drug dealers." "On the premises" was an example of using vague language to avoid the truth. It was so routine that the cops hardly saw it as lying. Which brings us, 46 years later, to the death of 25-year-old Freddie Gray, whose arrest on April 12 was partially recorded on video -- just the last seconds, in which he was shown face-down on a sidewalk, a cop on either side of him, and then, seeming unable to walk, dragged to the back of a prisoner transport van. He was shouting in apparent pain. Police reported that Gray had been "arrested without incident." It is a phrase so routine, perhaps the officers themselves could not see it as untrue. From their point of view, Gray's arrest was routine. He had made eye contact with them, then ran, and he was chased, caught, handcuffed and loaded into the van. That's what they do. But it was hardly routine for Freddie Gray, whose short life was marred by childhood exposure to lead dust in his mother's cheap rental home and later a long rap sheet of drug arrests. Sometime between eye contact and Gray becoming unresponsive and not breathing, his spinal cord had been snapped. He died a week later. The death became Baltimore's Missouri Moment -- its turn in the global spotlight, with angry demonstrations following deaths at the hands of police in Ferguson, Mo., New York City and other communities. Charm City, one of the local and usually ludicrous nicknames, is under a State of Emergency and occupied by National Guard soldiers after the demonstrations grew into a riot of looting, burning and violence. Later this week, police promise a fuller report on Gray's arrest and death as the department turns over the investigation to the Baltimore state's attorney's office -- the prosecutorial arm of the criminal justice system. Meanwhile, six police officers involved with the arrest and transport of Freddie Gray remain suspended with pay. And key questions from a period of some 30 minutes remain unanswered -- starting with what was the "probable cause" for Freddie Gray's arrest. The joke, of course, is that he was simply "running while black." And how could his spinal cord have snapped? Before that bystander's video began, did an officer have a knee resting on Gray's neck? Left unattended and without a safety restraint in the caged confines of the transport van, was he given a "rough ride" to the police station? Nothing here is simple, other than the public response to deaths at the hands of or in custody of police in a nation that has changed, remarkably, since the 1960s. What once was routine is anything but.